Earlier in May it had been estimated that up to 4000 Irish soccer supporters were going to travel to the World Cup qualifier in the Faroe Islands on June 8, but this number has now been scaled down a bit. The estimation is now somewhere between 1000 and 1500. But many more than those 1000-1500 Irish supporters had planned to travel to the Faroe Islands, but because the islands are a situated a bit strategically unlucky in the lonely north Atlantic, the journey is too expensive for many of the Irish fans. Accommodation in the Faroe Islands has also been a concern for some, as there is only accommodation for around 1500 people in total, when all hotels, bed & breakfast, youth hostels and apartments in all the islands are counted. This will still be the biggest “supporter-delegation” that has visited the Faroes regarding soccer. The previous record is from 2003 when more than 600 Germans visited and in 2002 when about 500-600 Scottish fans visited the Faroes. But recently, the Tourist Information Center in Tórshavn had an ad in the papers, where they appealed to the Faroe Islanders to privately accommodate for the Irish supporters that had problems finding other accommodation. Many have responded positively to the ad already, so the Irish supporters don’t have to worry too much for having to sleep in the open. The ad, which was in the paper: “Help us to give Irish soccer supporters roof over the head” Another problem has been the low number of tickets that are available for the Irish. 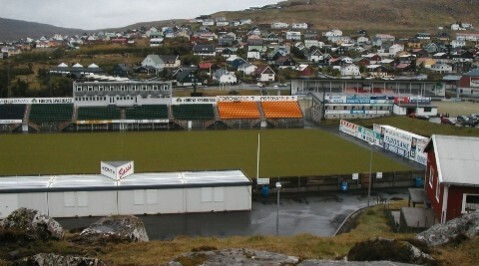 The stadium where the match will be played, Tórsvøllur Stadium, only has 5800 seats. Usually, away teams are given 10% of the tickets and that would be 580, but however, the Faroese Football Association has set aside 900 tickets for the Irish fans. But that will still leave some of the Irish faithful without a ticket. But that does not stop some of them from travelling to the Faroes anyway. And maybe the “ticket-less” are more lucky in the Faroe Islands than they would be in most other countries, because they have found out that the soccer ground can bee seen from a hill outside the stadium itself. There are two places where the pitch can be seen from outside the stadium. One of those places is behind one of the goals. But the problem here is that the nearest goal can not be seen because of the containers that have been placed there. Otherwise it would be perfect to watch the game from there. But there is a hill along the long-side of the pitch where most of the pitch can be seen from. This place the Irish supporters have already given (the politically incorrect) name “Jew Hill”. As I understand, the term comes from Millwall´s old Den, where there was a hill one could be watching the matches outside the stadium (?) (Don’t quote me on that, though). But I don’t dare using a politically incorrect name, so I will just call it the Irish Hill. And with maybe hundreds of Irish supporters occupying it, what better name could it possibly have than Irish Hill? This is a view from the “Irish Hill” itself looking over the pitch. Most of the pitch can bee seen from here; most importantly, both the goals. 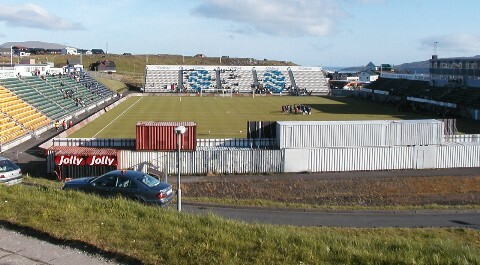 At one stage, there was a rumor spreading amongst the Irish supporters that the match would be mowed to Denmark, so that more Irish supporters, many thousands of them, could attend the match, instead of the small number the stadium in Tórshavn can accommodate for, and thus the Faroese Football Association would make much more money. However, that has never been on the agenda in the Faroe Islands and such a move would of course never happen, as it would be the ultimate insult to the Faroese supporters. Ask any Irish supporter if he would like Ireland to play their home games in London…? But for some Irish supporters, the biggest problem is neither tickets, nor travelling expenses. No, it’s much more serious than that. Their biggest problem is beer! They are not sure if it can be bought at all on the islands. That seems to bring back nightmares from Iran for some of the supporters, where they had to walk around thirsty for days :-), when Ireland played Iran in a World Cup play-off match in November 2001… But hey, thanks for the Internet, because one supporter had been Google-ing for days for “beer” in the Faroe Islands and he had finally found the website of the “monopoly alcohol shops” where he had found a pricelist. Well, he would be getting his daily supply of beer all right, it seemed, although a bit expensive, so he would definitely make the journey to the Faroe Islands. 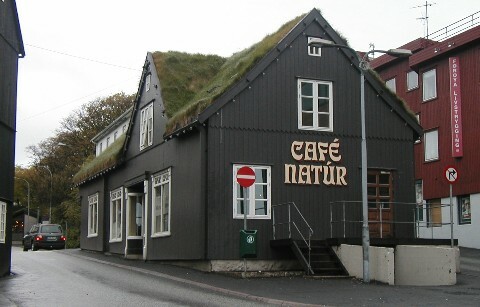 Café Natúr in Tórshavn, where many soccer supporters have visited over time and once again it will be the center for a soccer entourage, when the Irish supporters invade the Faroe Islands in early June. One Irish fan suggested that they should all wear a green bobble hat to honour goal keeper Jens Martin Knudsen, who became famous when he guarded the goal (wearing a (white) bobble hat) in the famous match in 1990 when the Faroe Islands beat Austria. Jens Martin is still part of the national team, but will most likely be on the bench. First choice goalkeeper will probably be Jákup Mikkelsen, who now plays for B36 Tórshavn. Jákup Mikkelsen had a brief spell at Partick Thistle in the Scottish Premier League in 2003. He was the first-choice keeper in the first games of the season, but was later replaced by Kenny Arthur. That didn’t help much though, as Partick was relegated at the end of the season. 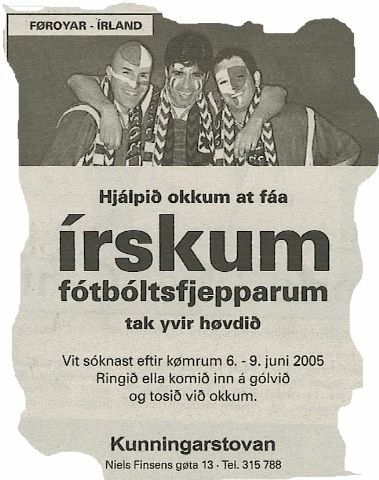 Jákup was released from his contract and moved back to his hometown Klaksvík, where he played for KÍ Klaksvík in 2004. In 2001 and 2002, Jákup Mikkelsen played for Norwegian club Molde, but was mostly second choice there. From 1994 to 2001 he played in the Danish Superliga and won the championship with them in May 2000. 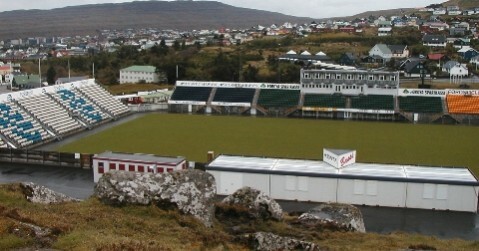 The group 4 Wolrd Cup qualifying match between the Faroe Islands and the Republic of Ireland will be played on June 8, 2005, 19.30 hrs at Tórsvøllur Stadium, Tórshavn.